We’ve been checking out selfie sticks for use with GoPro cameras and taken a number of factors into account. Our overall top pick is the GoRad Gear Selfie Stick for GoPro Hero Cameras (details below), and we’ve also suggested some great alternatives. This waterproof extension pole can be used in just about any conditions or environment. GoPro cameras have soared in popularity over the last few years thanks to their rugged, compact, durable nature that means they can be used in any kind of conditions. As a result they are great for action and sports capture, and of course, GoPros also have a reputation for offering great video and image quality. While some accessories come packaged with GoPro cameras, something that GoPro users shouldn’t ignore are the amount of additional peripherals that are available, such as camera mounts, remotes memory cards, auto chargers, and mic adapters. These accessories can really enhance your experience of using a GoPro camera and make your results even more professional, and yet another such accessory is the selfie stick. What are the best Selfie Stick for Go Pro camera? So what are the benefits of using a selfie stick? You might not want a typical selfie pouting shot, but these extension poles will enable you to capture yourself in action, or they can be used for a more interesting aerial view or an alternative perspective. They are extremely popular items, and there are numerous selfie sticks available explicitly designed for use with a GoPro, while others are compatible with GoPro cameras as well as other cameras and also some cellphones. However, it’s not always easy to know which selfie stick to choose as they come with a variety of features, though there are some things that should be taken into account when making your pick. Initially, it’s worth thinking about what you are most likely to use a selfie stick with your GoPro camera for. 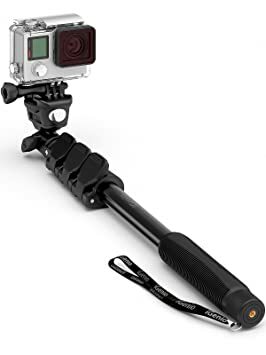 As you have a camera that can withstand the elements you should look for a selfie stick that’s also sturdy and durable in any environment, so steer away from anything that looks or feels flimsy. Another benefit that might be useful is to choose a selfie stick that’s not only waterproof but saltwater-proof too. After all, as your GoPro is waterproof you might want to use the selfie stick underwater or while taking part in watersports. 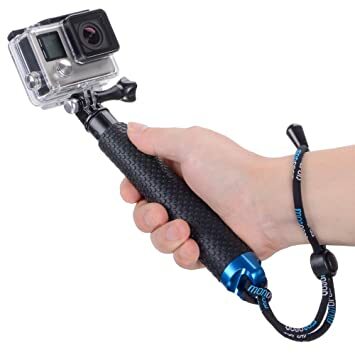 Ideally, it’s a good idea for a GoPro selfie stick to have a wrist strap attached to keep it exactly where you need it to be. It’s also worth considering if the selfie stick can be used as a tripod as well, or if there are any other extras. We’ve been checking out some of the most highly rated selfie sticks and produced our best GoPro camera selfie stick selection, which might help you when making your own choice. All of these have something to offer and we’ve tried to suit all budgets. It’s just up to you to choose the one that best suits your needs. Please note that all prices were correct at the time of writing but are subject to change. You can see detailed information on each item at the links provided. The GoRad Gear Selfie Stick for GoPro Hero cameras has plenty to recommend it. This waterproof extension pole can be used in just about any conditions or environment. It extends from 17 to 40-inches and has a twist locking system, so it’s good as a camera grip for close-ups and also for selfies once extended. It’s made to be durable, with rust-resistant anodized aluminum tubing, aluminum tripod mount, and CNC aluminum thumbscrew. It’s nicely sturdy with a premium feel, held our GoPro camera securely with no movement, and comes with a 100% lifetime guarantee for peace of mind. 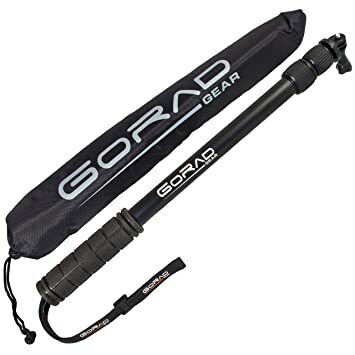 This monopod also comes with a wrist strap and handy nylon carry bag that has a storage pouch and adjustable shoulder strap. One thing we would say about this and any other waterproof selfie stick is to rinse it after each use to keep it at its best. We had no complaints at all about the GoRad Gear Animas Selfie Stick for GoPro Hero Cameras, although a drawback for some might be that it’s not the most compact to carry around. This versatile waterproof accessory is GoPro’s proprietary version of a selfie stick so should be included among our choices, although we didn’t feel it was quite as rugged as we’d like. Even so, it seemed to work fine for pictures on the move, and the hybrid design means it can be used as a camera grip by removing the handle from the arm, as a mini tripod (stored inside the handle), or as an extension arm so it’s suitable for selfies, so it’s good for POV footage, static shots and more. It has a folding arm and when collapsed it measures 7.5-inches or when extended that grows to 20-inches. One of the best points of the GoPro selfie stick is it’s easy to keep the mount out of the shot because of the folding arm. It’s a good product but the current price (although cheaper than usual) might deter some buyers. 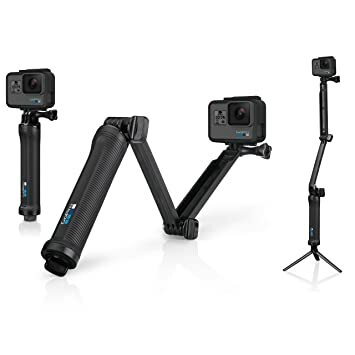 This one has something a little different to offer as it has a three section foldable pole design that lends itself to different shapes and can be used as a camera grip, foldable extension arm, or low angle shot stabilizer. While the pole is not as long as many other selfie sticks as it extends to only 19.3-inches, it’s also shorter when folded at just 5.9-inches, meaning it’s a good choice for those who want something nicely compact and portable. 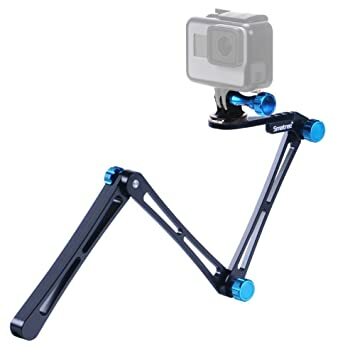 It’s made of lightweight aluminum alloy and also features a Smatree tripod mount that can be adjusted to any angle, screw, wrench, and adjustable wrist strap. This Selfie World Professional 10-in-1 accessory is the longest telescopic selfie stick included in our picks. When compacted it measures 15-inches and when extended it reaches to a whopping 47-inches. As well as GoPro cameras it’s also suitable for use with digital compacts as well as smartphones. It has a quick release system, is made from lightweight weatherproof materials, and the build quality is strong and robust, and as well as all this it has a silicon rubber grip that makes it comfortable to hold. A useful nylon carry bag with an adjustable shoulder strap is also included with this purchase. Please note that another more expensive ($29.99) version of this Selfie World 10-in-1 selfie stick for GoPro is available that comes with a Bluetooth Remote Shutter, which might sound like a good idea. However, the remote is only for use with cellphones and not GoPros so be aware. As well as GoPro cameras this accessory is also compatible with some other devices. This is our budget pick and it might be a good choice if you want to try out a selfie stick but don’t want to splash out too much money before you know if it’s worth investing in further. It’s lightweight but feels surprisingly sturdy, especially given its low price, and it’s made of aluminum with a non-slip soft handgrip and a wrist strap as well. The selfie stick extends from 7.25 to 19-inches so it’s not the longest. However, it’s still very usable and nicely compact and portable. Although the maker states that this accessory is waterproof, do note that if you use it in salt water the advice is to rinse with fresh water and dry after every use. Weeding out the best GoPro camera selfie stick from the many available was not an easy task so we had to narrow the choices down before we chose some for testing. We, therefore, concentrated on those that had been recommended by experts and retailers, as well as those receiving good user reviews. It’s worth saying that selfie sticks for GoPro cameras that include a built-in shutter button are very scarce, and in fact, none of our best picks included one, although it’s possible to use third-party remotes that are readily available. However, various other factors were taken into account in our testing, and we soon realized that the optimal length of the selfie sticks would vary according to user and purpose. We’re confident that different requirements have been considered among these picks and therefore there should be something here for all tastes. All that’s left to say is… get snapping!